Tidy up drawers in your home with Seville Classics' Expandable 5 Compartment Drawer Organizer. Tray has three static compartments and two that expand on either side. 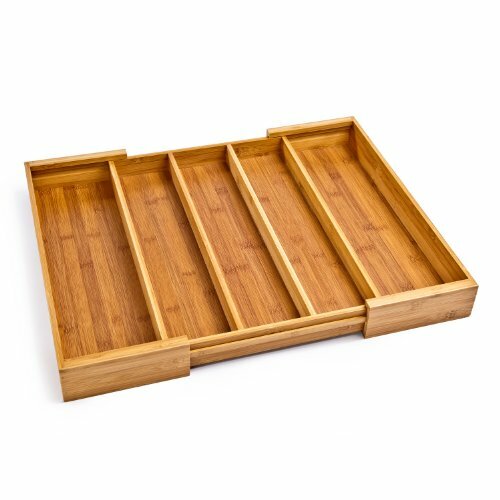 Built from bamboo, our tray is a natural, durable alternative to plastic and hardwood utensil trays and drawer organizers. Bamboo is as dense as maple and lighter weight than oak. Extra-long compartments are ideal for organizing kitchen tools, like spatulas, whisks, ladles, corkscrews and gas lighters. Use it outside the kitchen to tidy junk drawers around the house. Organize art supplies like pens, pencils, brushes, paint, and ink. Keep needles, crochets sticks, thimbles and thread for seamstresses in order. Cleans easily with a damp cloth and soap. DO NOT submerge in water Perfect for storing utensils in kitchen drawers Expands from 13” to 23” wide; from 3 compartments to 5 Frame and dividers made from sustainable, all-natural bamboo Bottom is made of MDF covered in a paper veneer Fits most standard drawers Specifications Dimensions: 13" to 23" W x 18" D x 2.5" H Weight: 4 lbs. Model #: BMB17036 Limited 1-Year Manufacturer's Warranty Seville Classics products are backed by a 1-year limited warranty unless otherwise specified. The warranty protects against original defects in material or workmanship under normal home or office use for the duration of the warranty period. - Sustainable, durable bamboo construction. Fast-growing and plentiful, bamboo is a naturally hardy building material. Easy to maintain, wipes clean with soap and water.